We're back in business. Gavin resumed therapy today and Brian went off to school. I can see that this will be a vicious cycle. Brian will bring home some school germs...some or all of us will get sick...therapy will be cancelled...Gavin will take a week to "get back into the swing of things" once he goes back to therapy...and when he is about to be "back to normal" again Brian will bring home school germs...and repeat. Miss Janna, Gavin's pre-school teacher, was here today to work on matching and drawing and colors. He was in and out of dreamland, but happy as always to see her!! I worked with Gavin on the iPad a lot this weekend. 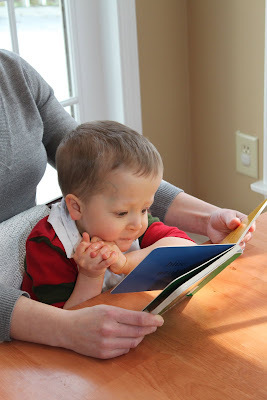 Last week, Miss Sara and I were talking about ways we could get Gavin to start recognizing letters of the alphabet. I asked her to search the app store for me and she found a really great app called ABC Alphabet Phonics. For now, we have him touching the screen that shows one letter at a time after the computer asks him to. For example, it says "Touch the B" and he touches the screen. Does he know that it's a B? Maybe! And if he doesn't, I'm hoping the constant repetition of seeing the big letter and touching it will store it in his brain. The app is really cute, customizable...and free. Who doesn't love free? I've been getting several questions from people who are wondering what's going on with the egg donor process. Nothing right now. I was scanned last week and will be scanned again this Thursday. Based on the results this week, I will be put on Lupron injections. I've been told that once I start Lupron to expect a 3-4 week wait before the embryo transfer. I'll be sure to keep you posted as things happen!! wow! What an incredible video! The control he is showing, and the skill and ability to move his hands up the rail...oh, and the way he almost effortlessly picked up his feet! Just wow!